As has been the case in previous years (see related articles below), Israel related content produced by the BBC during 2017 frequently included contributions or information sourced from NGOs. However, in the vast majority of cases audiences were not informed of the political agenda of the organisations and their representatives promoted in BBC content and on some occasions the connection of an interviewee to a particular NGO was not revealed at all. For example, an interviewee who was featured on BBC World Service radio at least three times between September 3rd and December 7th (including here and here) was introduced as “a mother of two” from Gaza but audiences were not informed that she works for Oxfam. Similarly the founder of Ir Amim and Terrestrial Jerusalem was introduced to BBC audiences in February as “an Israeli attorney and specialist on the mapping of Jerusalem” and in June as “an Israeli lawyer specialising in the geo-politics of Jerusalem”. 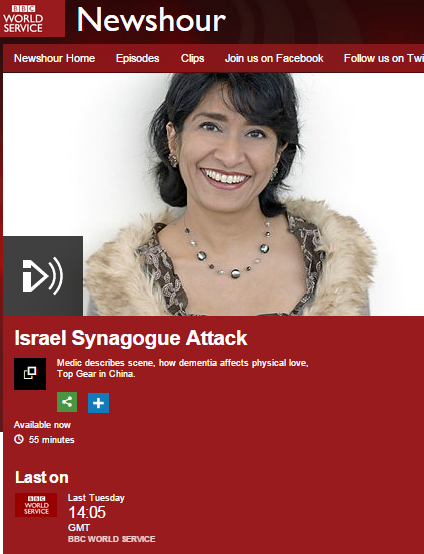 In September a BBC World Service history show featured an interviewee without mentioning her significant connection to Medical Aid for Palestinians and related anti-Israel activism. In October the same programme featured a sole interviewee whose connections to the NGO Euro-Med Rights were not revealed to audiences. Interestingly, when BBC radio 5 live recently conducted an interview concerning a UK domestic story with a political activist who was inadequately introduced, the corporation acknowledged that “we should’ve established and made clear on air this contributor was a political activist”. On other occasions, while contributors’ connections to NGOs were clarified, the political agenda of the organisations concerned was not. In October, when an interviewee from the Amos Trust appeared on BBC Radio 4, the NGO was inadequately described as “a Christian organisation working in the West Bank and Gaza” with no mention made of its anti-Israel activities. A TV debate concerning the BDS campaign that was aired in February included representatives of War on Want and the Palestine Solidarity Campaign with no background information concerning the rich history of anti-Israel campaigning by both those organisations provided to viewers. In September the BBC World Service interviewed the director of ‘Forward Thinking’ which was described as a “mediation group” while listeners heard no clarification of the relevant issue of the interviewee’s “particular viewpoint” on Hamas. Audiences also saw cases in which BBC presenters amplified unsubstantiated allegations made by political NGOs during interviews with Israelis. In June, for example, while interviewing Moshe Ya’alon, Stephen Sackur invoked Human Rights Watch and Breaking the Silence. In November Andrew Marr employed the same tactic during an interview with the Israeli prime minister, amplifying allegations from Human Rights Watch and Amnesty International without informing viewers of the political agendas of those NGOs. Additional NGOs promoted by the BBC without disclosure of their political agenda include Adalah and the Jerusalem Legal Aid and Human Rights Center (see here) and UJFP. Material produced by the UN agency OCHA was promoted in BBC content without that organisation’s political stance being revealed and audiences saw a partisan map credited to UNOCHA and B’tselem used on numerous occasions throughout the year. The political NGO Peace Now was frequently quoted and promoted (including links to its website) in reports concerning Israeli construction plans – see for example here, here and here – as well as in an amended backgrounder on the subject of ‘settlements’. In April the BBC News website described Breaking the Silence and B’tselem as “human rights activists” without fully informing audiences of their records and political agenda. B’tselem was by far the BBC’s most promoted NGO in 2017 with politically partisan maps it is credited as having produced either together with UNOCHA or on its own appearing in dozens of BBC News website reports and articles throughout the year, including the BBC’s backgrounder on ‘settlements’. BBC audiences were on no occasion informed that the organisation from which that map is sourced engages in lawfare against Israel and is a member of a coalition of NGOs supporting BDS. The NGOs quoted, promoted and interviewed by the BBC come from one side of the spectrum as far as their political approach to Israel is concerned and some of them are even active in legal and propaganda campaigns against Israel. Yet the BBC serially fails to meet its own editorial guidelines by clarifying their “particular viewpoint” and – as in previous years – in 2017 audiences hence remained unaware of the fact that the homogeneous information they are receiving about Israel is consistently unbalanced. Just over two years have gone by since Tim Franks did a special feature on Jerusalem (see ‘related articles’ below) for the BBC World Service radio programme ‘Newshour’ in which he went to visit the Givat HaMatos neighbourhood, where he discussed what was inaccurately represented as a ‘new’ development project with a representative from the political NGO ‘Ir Amim‘. The January 30th 2017 edition of ‘Newshour’ found the same BBC reporter revisiting the same location with the founder of that same NGO. As was the also case when Franks provided Seidemann with a platform in the programme from just over two years ago, that introduction is inadequate. Once again Franks failed to inform audiences that Seidemann is the founder of the foreign government funded (including the UK) political NGO Terrestrial Jerusalem and that he also founded Ir Amim. That context – had it been supplied with an explanation of the political agenda of the organisations to which Seidemann is linked – would have better allowed BBC audiences to put his ensuing words – including his interpretation of the two-state solution – into their appropriate context. 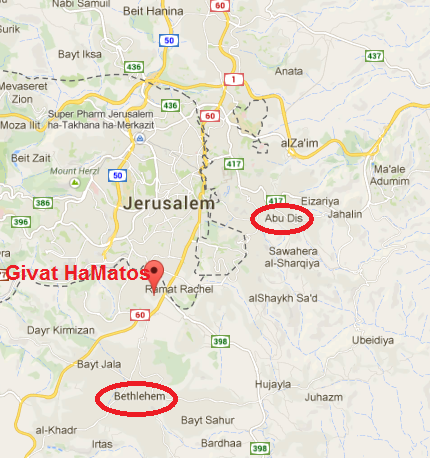 The BBC has been reporting on the Givat HaMatos project since 2012. Tim Franks should therefore be aware of the fact that since the beginning, half the proposed housing units there have been ear-marked for Arab residents of the adjacent neighborhood of Beit Safafa. However, he chose not to inform listeners of that fact before providing the next cue for his interviewee. The interview with Seidemann ends there, with Franks failing to question the basic assertion which the BBC has been dutifully repeating and amplifying since 2012: that development of the Givat HaMatos neighbourhood would mean an end to the two-state solution. Likewise, Franks made no effort to challenge the assumption of ‘Palestinian land’ and failed to provide the all-important historical context of the 19-year Jordanian occupation of Jerusalem or the expulsion of Jews from parts of Jerusalem in 1948. Clearly audiences should have been informed of Seidemann’s links to NGOs with a very clear political agenda on this topic and the fact that they were not means that this item steered audiences towards viewing particular and partial political claims as fact. The rest of this audio report will be discussed in part two of this post. Back in December we noted that our colleagues at CAMERA had secured corrections to inaccurate information appearing in an article published by Associated Press which was largely sourced from an employee of a political NGO previously quoted and promoted in BBC content. “”They (Israelis) are trying to uproot us from Jerusalem, they are stealing the houses, the trees and the stones of the city,” laments Nura Sub-Laban, a Palestinian woman featured in The Associated Press article today by Karin Laub and Mohammed Daraghmeh (“Palestinian eviction case spotlights Jerusalem settler push“). The subject matter of that AP article cropped up again last week during Prime Minister’s Questions in the UK Parliament. The ‘BBC Parliament’ TV channel of course broadcast the February 24th session which included a question from the MP for Bradford East (available in the UK only from 29:22 here). Mr Hussain and additional Labour MPs did indeed visit the region earlier in February on a trip organized by the charity Medical Aid for Palestinians (MAP) and the Council for the Advancement of Arab-British Understanding (CAABU). As readers may recall, MAP has been used by the BBC in the past as a source of information and a BBC reporter showcased one of its projects in 2014. CAABU’s director Chris Doyle and other representatives are frequent contributors to BBC content. According to CAABU’s Joseph Willits, the part of the trip which involved a visit to the Sub Laban family was facilitated by the foreign funded political NGO Al Haq which is of course active in the ‘lawfare’ campaign against Israel and is from time to time promoted in BBC content. Unsurprisingly given the agendas of all the groups involved in organising this visit, the British parliamentarians were obviously not told the entire story. ‘handed to an Israeli government department, the General Custodian. Palestinian residents were recognized as “protected tenants,” provided they continued to live in the apartments and pay rent to the Custodian. But the article’s underlying flaw is that initially nowhere did it state that at that point, in 2001, the family failed to move back into the property, which is the crux of the legal argument against them. In other words, the claim made by Mr Hussain in Parliament that “Israeli settlers, however, are now trying to force Nora from her home of over 60 years” is inaccurate not least because two courts of law have established that she did not live in that rented apartment for thirty of those years. Naturally, Mr Hussain’s amplification of that political propaganda in Parliament was appreciated by his hosts. The problematic aspects of the relationship between the media and political NGOs have previously been raised on these pages. “As time goes by the mutually beneficial relationship between the traditional media and NGOs flourishes and expands and news consumers find that more and more of their news comes or is sourced from agenda-driven organisations which make no claim to provide unbiased information and are not committed to journalistic standards. One result of the BBC’s unchallenged promotion of information provided by NGOs often portrayed as ‘human rights groups’ is the ensuing ‘halo effect’ which leads members of the public and politicians alike to refrain from critical examination of the facts behind claims made by campaigning groups with a clear political agenda – as, sadly, the above example shows only too well. Our colleagues Tamar Sternthal and Gidon Shaviv recently prompted corrections to an article produced by Associated Press. The main source of the inaccurate information originally appearing in that AP report is one Ahmed Sub-Laban and if the name rings a bell for BBC Watchers, that is probably because the partisan testimonies of that employee (and others) of the foreign-funded political NGO ‘Ir Amim’ have also been used by the BBC in the past – but without the necessary “summarising” of his “standpoint” demanded by BBC editorial guidelines on impartiality. As this AP story clearly shows, transparency concerning the affiliations of NGO employees used as sources or interviewees and accurate presentation of the political agenda of such sources of information is paramount if the BBC is to be able to claim that the news it provides to its audiences is impartial. Those who happened to be listening to the BBC World Service at 2 a.m. GMT on May 18th will have heard the following item in the news bulletin (from 03:40, available for a limited period of time only) read by Fiona MacDonald. “Israeli police have clashed with Palestinians protesting against a march by Jewish nationalists to mark Israel’s capture of East Jerusalem in 1967. Palestinians threw stones as Israelis bearing flags marched through the predominantly Muslim old walled city. A Palestinian activist, Ahmad SubLaban, said the march was a provocation. MacDonald is of course describing Jerusalem Day or Yom Yerushalayim – the national holiday marking the reunification of the city after nineteen years of division due to the occupation by Jordan between 1948 and 1967. That context is glaringly absent from her distorted description of the purpose of the event. Among the numerous events taking place on May 17th to mark the occasion was the traditional march to the Western Wall, which for geographical reasons obviously has to pass through what MacDonald bizarrely finds necessary to describe as “the predominantly Muslim old walled city”. Not unrelated to the content and style of this news item is the fact that this year, two political NGOs unsuccessfully petitioned the High Court in an attempt to prevent the march (now in its thirtieth year) from passing through the Old City’s Muslim Quarter. One of the political NGOs which filed the rejected petition was the foreign funded Ir Amim. One of Ir Amim’s employees is Ahmad SubLaban – apparently the same inadequately introduced man given a platform by the BBC World Service from which to promote political propaganda. BBC Watch enquired about SubLaban’s claims that “residents are forbidden from entering or leaving” the area and that “shopkeepers are forced to close their stores” and was not informed of any restrictions imposed on movement or commerce, although according to the Israeli police force, some shopkeepers do chose to close earlier than usual on that day. We were also informed that there were no reports of damage to shops or properties and that two police officers were lightly injured by participants in an illegal protest at Damascus gate in which stones and bottles were thrown. Interestingly, a strikingly similar interpretation of those words to the one presented by the BBC is to be found in the headline of an article appearing in Ha’aretz which reads “Netanyahu: Jerusalem is the capital of the Jewish people alone”. Whilst the Ha’aretz article supplies context to that misleading headline, the BBC World Service appears to have further garnished it in such a way that listeners would inevitably misunderstand the meaning and intention of the words spoken. Were the BBC to expand its news gathering beyond one Israeli newspaper of a specific political stripe and beyond inadequately introduced representatives of political NGOs of a particular genre, the accuracy and impartiality of its reports on events in Israel would of course be vastly improved. However, as this example of a supposedly factual item in a news bulletin once more indicates, the BBC’s reliance upon sources promoting a distinct political view defines, restricts and shapes the objectivity and accuracy of information passed on to audiences worldwide. Ir Amim of course does a lot more than just ‘plot changes’: it is an NGO with a clear political agenda which should have been clarified to BBC audiences before they were exposed to its researcher’s unchallenged claims. Contrary to the statement made by Franks, the plan to build housing in Givat HaMatos is not “new” and it certainly is not from “the last couple of months”. 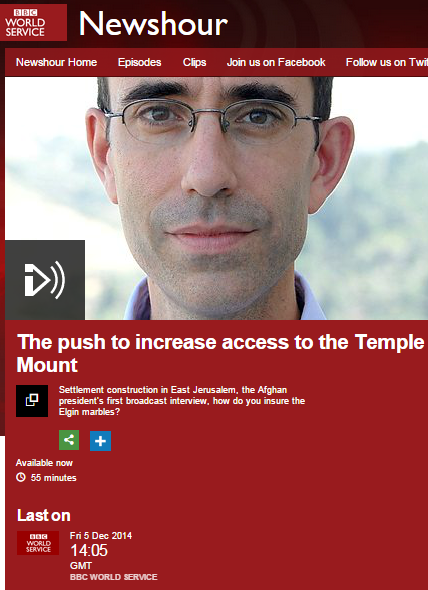 In fact, the BBC has been misreporting that topic since December 2012 – a full two years before Franks’ report went on air – and since that date the BBC has also been claiming that new apartments in Givat HaMatos (around half of which are ear-marked for Arab residents of nearby Beit Tsafafa) would “cut Palestinians in East Jerusalem off from their West Bank hinterland”, just as Tatarsky does. What no BBC report so far – including this one – has told audiences is that Givat HaMatos is in an area which, under any realistic scenario of a peace deal, would remain under Israeli control. What has also not been made clear is that it would be perfectly possible – and even logical – to construct a road leading from Bethlehem to, say, the Palestinian Legislative Council building in Abu Dis without passing through Givat HaMatos. Rather than informing audiences accurately about this issue, however, Tim Franks, elects to give a platform to politically motivated sloganeering which does not even hold geographical water. Next Franks goes to Issawiya to interview one Naim Hamdan whose nephews built a house without planning permission and are apparently now upset that the municipality has since demolished the structure, just as would be the case in any Western country. Franks grants Hamdan a platform to promote an egregious and redundant comparison between the demolition of a structure lacking planning permission and a hypothetical armed mugging in London. Hamdan: “What you will think? When someone stronger than you in the middle of London and hold a gun to your head; give me your money. What you will think when someone come to demolish your home? Are you gonna be happy? I don’t think so. I don’t think so. As Franks then informs listeners, that voice belongs to Daniel Seidemann who is introduced as “a lawyer and activist” and who has appeared with similarly inadequate introduction in several recent BBC reports. Franks fails to inform audiences that Seidemann is the founder of the foreign funded political NGO Terrestrial Jerusalem and that he also founded Ir Amim. That context – had it been supplied with an explanation of the political motivations behind the organisations to which Seidemann is linked – would have allowed BBC audiences to put his ensuing uninterrupted monologue into context. Tim Franks clearly embraces Seidemann’s simplistic and cherry-picked narrative which completely erases from audience view recent Palestinian terrorism (including the kidnapping and murders of three Israeli teens in June) and Hamas’ instigation of the summer conflict whilst simultaneously failing to ask why parents and community leaders have made no discernible effort to put an end to such violent rioting or how the background of official PA incitement and glorification of terrorism legitimizes and encourages such acts. He then goes on to reinforce Seidemann’s spurious conjecture by promoting his own, similar picture. Obviously, Jerusalem’s light rail system was designed primarily to provide transport for all the city’s inhabitants rather than for the reasons of symbolism dubiously attached to its construction by Franks. He then goes on to allow his three anonymous teenage “stone-throwers” an unhindered platform to make the unverified claim that they were “imprisoned” because they are relatives of Mohammed Abu Khdeir and fails to make any effort to dig deeper into the kind of mindset which prompts statements such as “his cousin’s blood won’t go just like this without having any revenge” and “throwing stones feeds you dignity”. In fact, the main factor evident in this part of the programme is Franks’ attempt to impose his own Western standards and cultural relativism on the phenomenon of violent rioting by Palestinian teenagers. Franks continues with an interview with the headmistress of a school in Jabel Mukaber and another with the mayor of Jerusalem Nir Barakat. Interestingly, he chooses to round off the special broadcast with an interview with the former British consul general in Jerusalem, Vincent Fean, who – as readers familiar with his record whilst he was in that position will not be in the least surprised to learn – is “now spending some of his time working to promote the international recognition of the Palestinian state”. Fean uses his unhindered platform to promote an inaccurate portrayal of the reasons for the failure of the last round of negotiations between Israel and the PLO. So what did BBC World Service listeners learn about the ‘why’ and the ‘how’ in that statement? They were told in the first part of the programme that one cause of tensions is Temple Mount, but provided with an inaccurate portrayal of the background to that topic. In the second half of the programme the focus was on ‘settlements’ and ‘disaffected’ youth with much misinformation and politically motivated manipulation of both those issues. Listeners were not, however, told anything about the incitement focusing on Jerusalem and Temple Mount in particular coming from the Palestinian Authority and the topic of how that incitement serves the PA’s current strategies was not explored at all. Moreover, Tim Franks provided Fatah official Husam Zomlot with a platform from which to downplay that crucial factor. The sole achievement of this special programme was in fact to reinforce the same mantras and narratives promoted by other BBC correspondents on other platforms so many times in the past. As usual, only things attributable to Israel are presented as factors contributing to ‘tensions’ and ‘division’. And as usual, Palestinians have no agency and no responsibility in the BBC’s chosen narrative. The very fact that Tim Franks managed to make an entire programme about Jerusalem without even once mentioning the recent terror attacks in that city speaks volumes about the motivations behind its production. Had Tim Franks’ trip to Jerusalem culminated in some serious reporting on the issue of PA incitement – which has been conscientiously swept under the carpet by the BBC for the past two months – the exercise would have been justified. As it is, the people who funded Franks’ trip actually gained very little new information which could enhance their understanding of the real background to this issue. The BBC World Service’s news and current affairs programme ‘Newshour’ began its coverage of the terror attack which had taken place at the Kehilat Ya’akov Synagogue in Har Nof, Jerusalem earlier in the day on November 18th in the afternoon version of the programme – available here from 00:45 to 12:50 and from 30:00 to 39:00. This of course was not the only occasion on November 18th upon which the BBC – despite the scientific evidence provided by senior pathologists – elected to amplify a dangerous narrative based entirely on evidence-free Palestinian incitement. That same propaganda was promoted on BBC television news and on the BBC News website – see here and here. Connolly did not inform listeners of the very relevant fact that many of those perpetrators belonged to assorted terrorist organisations or that some of the attacks were later claimed by such groups. Later on in the conversation, Connolly presented audiences with his menu of ‘contributing factors’ to the surge of terror and violence over the past few weeks. As has been noted here before, the status quo on Temple Mount actually relates to additional issues besides prayer rights for non-Muslims (Connolly failed to inform listeners that the site is also holy to Christians, who are not allowed to pray there either) and other changes have been made to aspects of the status quo over the years which have not been regarded as an “incendiary issue”. Interestingly, despite its being defined by Connolly as a “key” issue, at no point in its extensive coverage of the topic of Temple Mount has the BBC made any attempt to address the subject of why the egalitarian idea of equal prayer rights for members of all faiths at a site holy to three religions should produce such a violent reaction in the “Arab and Muslim world” or how that issue has been employed over the years as a catalyst by leaders with political interests, just as it is being used now. Later on in the programme, listeners heard a recording of the US Secretary of State’s condemnation of the terror attack before Razia Iqbal introduced two interviewees from Jerusalem – presented as giving an Israeli and an Arab view of life in the city. However, in breach of BBC editorial guidelines on impartiality (as was also the case on the BBC News website’s live page of the same day), the Israeli interviewee – Daniel Seiderman – was presented only as “a lawyer” and not as a political activist with the NGOs ‘Ir Amim’ and ‘Terrestrial Jerusalem’, meaning that audiences were not able to place his contribution in its correct political context and to understand that they were actually hearing two views from the same school of thought rather than differing ones. The evening version of the November 18th edition of ‘Newshour’ will be discussed in a later post.